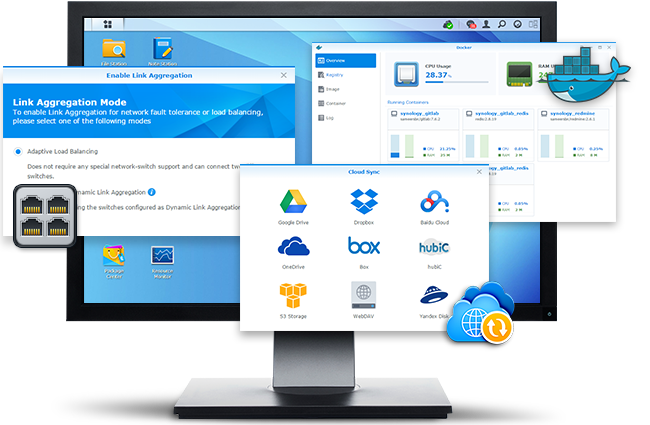 Synology America Corp., today announced the beta release of DiskStation Manager (DSM) 5.2, the latest version of its award-winning NAS operating system. Coming with both exciting new functionalities and under-the-hood changes, DSM 5.2 is built to make managing a private cloud even more effective, secure, and intuitive. Ÿ Streamlined application deployment and higher productivity: The integration of Docker allows developers to ship, and users to run, a vast number of applications on Synology NAS with minimal time and resources needed. SSO Server lets users gain access to all services in the same domain with only one single log-in. File Station now can be connected with public clouds so you can browse and manage files in them without taking up bandwidth. Ÿ Faster, more customizable cloud syncing with encryption: The smart polling technology dramatically increases Cloud Station’s performance while at the same time reducing network traffic and server overhead. The number of file versions is also customizable for each shared folder. When syncing with public clouds, besides compatible with more Amazon S3 and WebDAV storage, you can now set up one-way sync – and even encrypt the data before uploading it to public clouds – immediately turning them to offsite backup destinations without sacrificing data privacy. Ÿ File-based backup restoration and smart version control: The new file browsing feature allows you restore a single file, instead of an entire shared folder, from past backups. You can also automatically rotate old backup data or iSCSI LUN snapshots when designated quota is reached or even benefit from the Smart Recycle policy. The latter helps you minimize storage consumption while still maintaining enough flexibility for point-in-time recovery. Ÿ Portable task manager and refined multimedia experience: With the all-new Synology Web Clipper and the to-do-list-turned-task-manager, Note Station and DS note lets you capture the best of the web into your pocket notebook, and then organize action points according to your schedule. Download Station’s new “preview” feature gives you a sneak peak of what’s being downloaded, saving you time and bandwidth from misleading torrents. Cue file support in Audio Station means you can switch between high-quality CD tracks at will. Want to display photos on big-screen TV? Now besides Apple TV, the support of Chromecast and DLNA TVs in DS photo also makes this possible. Ÿ AppArmor and SMB 3 encryption to strengthen security further: AppArmor extends its reach to profiles for packages to effectively restrict malicious software from accessing unauthorized system resources. The support of SMB 3 encryption enables Synology NAS to secure file transfers to Windows 8 and Windows Server 2012, reducing the possibility of tampering and eavesdropping when data moves across a company’s network. Synology will hand out a DS214se to each of the three beta testers who provide the most valuable assistance and feedback. Please visit www.synology.com/en-us/dsm/5.2beta/ for more details. Visit the live demo site at www.synology.com/products/dsm_livedemo to try out new features.